Each Fence & Deck Connection fence is more than an enclosure surrounding your pool; it's a reflection of your lifestyle, custom tailored to complement your home's architecture, pool, and back yard. We understand that as you move forward with the many decisions that are part of creating a backyard dream, choosing your new pool fence can prove harder than anticipated. With varying county codes & permitting, styles and colors, simplifying the process is our commitment to you. 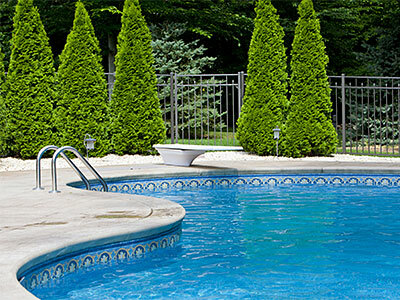 Fence & Deck Connection has been installing pool fencing for more than 16 years using the finest quality materials available, while providing the highest level of workmanship in the industry. You can rest assured that we will do everything possible to make your project go smoothly. The BOCA National Building Code contains a set of guidelines when building barriers and fencing around a swimming pool. These are only guidelines, but your local government has law-binding codes that likely reflect these guidelines very closely. BOCA building codes should act only as a supplement to your local building codes. The links provided at the top of this page should give you a general understanding of your area's codes, but keep in mind that these codes can change. The most up-to-date requirements are available online via your county government's website.